She found a rabbit on her head. Thoughts of doots filled her with dread. perhaps a bit of whole wheat bread? one cannot go about in fear. you're not a hat; get out of here. ha. now wouldn't that be something....to be stuck with a bunny on your head...at least its not the easter bunny....he lays eggs...smiles. LOVE this, Ann! If I knew more bunny handlers at the shelter, I'd be passing this one along to them all. Hells, yes! I love this bunny 55. Watch out for the cocoa puffs! 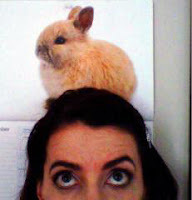 I have a Bunny Hat as well. I'm tellin ya, between you Rabbit Girls, and the Goat Ladies. I'm assembling quite an entourage of barnyard love. Loved your Pic, Loved your ditty. And here the kids are always putting the cats on their heads. What is scarier, doots or claws? Ah, I see why rabbits make poor hats. Great way to keep all your thoughts from escaping into the ether. Flash 55 - Wanted: Dead or Alive? Rabbit ears - from 1950's TV to you. One of the rabbit girls! I've never had a bunny on my head but I've bottle fed a calf. Happy Weekend!